Network-attached storage (NAS) is dedicated file storage that enables multiple users and heterogeneous client devices to retrieve data from centralized disk capacity. Users on a local area network (LAN) access the shared storage via a standard Ethernet connection. NAS devices typically do not have a keyboard or display and are configured and managed with a browser-based utility. Each NAS resides on the LAN as an independent network node, defined by its own unique Internet Protocol (IP) address. What most characterizes NAS is ease of access, high capacity and fairly low cost. NAS devices provide infrastructure to consolidate storage in one place and to support tasks, such as archiving and backup, and a cloud tier. NAS and storage area networks (SANs) are the two main types of networked storage. NAS handles unstructured data, such as audio, video, websites, text files and Microsoft Office documents. SANs are designed primarily for block storage inside databases, also known as structured data. NAS enables users to collaborate and share data more effectively, particularly work teams that are remotely located or in different time zones. A NAS connects to a wireless router, making it easy for distributed work environments to access files and folders from any device connected to the network. Organizations commonly deploy a NAS environment as the foundation for a personal or private cloud. There are NAS products designed for use in large enterprises, as well as those for home offices or small businesses. Devices usually contain at least two drive bays, although single-bay systems are available for noncritical data. Enterprise NAS gear is designed with more high-end data features to aid storage management and usually comes with at least four drive bays. Netgear is one of several popular NAS vendors. 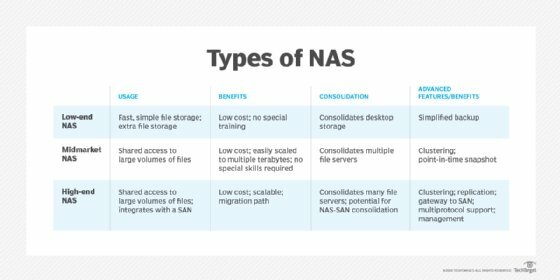 Prior to NAS, enterprises had to configure and manage hundreds or even thousands of discrete file servers. To expand storage capacity, NAS appliances are outfitted with more or larger disks -- known as scale-up NAS -- or clustered together for scale-out storage. In addition, most NAS vendors partner with cloud storage providers to give customers the flexibility of redundant backup. While collaboration is a virtue of NAS, it can also be problematic. Network-attached storage relies on hard disk drives (HDDs) to serve data. Input/output (I/O) contention can occur when too many users overwhelm the system with requests at the same time. Newer NAS systems use faster flash storage, either as a tier alongside HDDs or in all-flash configurations. The type of HDD selected for a NAS is dictated by the applications to be handled. Sharing Microsoft Excel spreadsheets or Word documents with co-workers is a routine task, as is performing periodic data backup. Conversely, using a NAS to handle large volumes of streaming media files requires larger capacity disks, more memory and more powerful network processing. In the home, people often use a NAS system to store and serve multimedia files or to automate backups. Homeowners may rely on NAS to manage storage for smart TVs, security systems and other consumer-based internet of things (IoT) components. In the enterprise, a NAS array can be a backup target for archiving and disaster recovery (DR). If a NAS device has a server mode, it can also serve email, multimedia files, databases or printing jobs. Some higher-end NAS products accommodate enough disks to support RAID (redundant array of independent disks), a storage configuration that turns multiple hard disks into one logical unit to boost performance, high availability (HA) and redundancy. High-end or enterprise NAS: The high end of the market is driven by enterprises that need to store vast quantities of file data, including virtual machine (VM) images. Enterprise NAS provides rapid access and NAS clustering capabilities. The clustering concept arose as a way to address drawbacks associated with traditional NAS. For example, if a particular NAS device is allocated to an organization's primary storage, it creates the potential for a single point of failure. Ways of dealing with this include spreading mission-critical applications and file data across multiple boxes and strictly adhering to scheduled machine backups. Vendors offer clustered NAS systems to combat NAS sprawl. A distributed file system (DFS) runs concurrently on multiple NAS devices to provide access to all files in the cluster, regardless of the physical node on which it resides. Midmarket NAS: The NAS midmarket accommodates businesses that require several hundred terabytes (TB) of data. Midmarket NAS devices cannot be clustered, however, which can lead to file system siloes if multiple NAS devices are required. Low-end or desktop NAS: The low end of the market is aimed at small businesses and home users that require local shared storage. This market is shifting toward a cloud NAS model, represented by products such as SoftNAS Cloud, Blue Chip's Virtual NAS and software-defined storage (SDS) from legacy storage vendors. Despite the growth in flash storage, NAS systems still primarily rely on spinning media. The list of NAS vendors is extensive, with most offering more than one configuration to help customers balance capacity and performance. NAS systems can be purchased fully populated with disk, or customers may purchase a diskless chassis and add HDDs from their preferred vendor. Drive makers Seagate, Western Digital and others routinely collaborate with NAS vendors to develop and qualify network-attached storage media. Accusys Storage Ltd. supplies scalable shared flash with Peripheral Component Interconnect Express (PCIe)-based ExaSAN. Accusys Gamma and T-Share devices are Thunderbolt 2-designed devices with built-in RAID protection. Apple Corp. launched the AirPort Time Capsule NAS device for Macintosh but discontinued the product line in 2017. Asustor Inc. is a subsidiary of Taiwanese computer electronics giant Asus. The Asustor NAS family includes the AS100 personal models and business storage with the AS3202, AS6202 and AS7004. Avere Systems Cloud-Core NAS (C2N) appliances integrate private or public object storage with a local NAS infrastructure. The storage is based on Avere's FXT Edge Filer, with a file system designed for object storage. Microsoft Corp. acquired Avere in January 2018. Buffalo Americas Inc. uses a burn-in process to qualify the HDDs integrated in its TeraStation desktop and rackmount NAS appliances. Buffalo's LinkStation NAS devices are targeted at small business and individuals. ClearSky Data added a scale-up NAS option as a managed service to complement its block storage and hybrid data protection. DataDirect Networks specializes in storage systems for high-performance computing, including the parallel file system-based GRIDScaler family for analytics, cloud and file workloads. DataON Storage certified its Scale-Out File Server to enable tunable shared clustered storage to Windows Server 2016. Dell EMC Isilon is a scale-out NAS offered in a disk and an all-flash model. The vendor recently introduced Isilon Cloud for Google Cloud Platform (GCP). Drobo 5N NAS is a low-end complement to the Drobo B810i and B1200i iSCSI (Internet Small Computer System Interface) midrange arrays. Excelero Inc. jumped in the market in 2017 with NVMesh Server SAN software, which sits between block drives and logical file systems. It writes data directly to nonvolatile memory express (NVMe) devices using its patented Remote Direct Drive Access (RDDA). Fujitsu Celvin NAS servers are suited for backup, cloud, file sharing and SAN integration cases. Hewlett Packard Enterprise (HPE) branched into NAS with StoreEasy models in varying capacities and price points. Hitachi Vantara offers Hitachi NAS Platform, which combines Hitachi's Virtual Storage Platform (VSP) arrays and Storage Virtualization Operating System (SVOS) and is geared to large VMware environments. Huawei OceanStor 9000 features a symmetrically distributed architecture that scales from three to 288 nodes. IBM Spectrum NAS combines IBM Spectrum SDS with storage hardware from partner Compuverde. Spectrum NAS runs on x86 servers. IBM Spectrum Scale handles file storage for high-performance computing. Spectrum Scale is SDS, based on IBM's General Parallel File System (GPFS). Infinidat built the petabyte (PB)-scale InfiniBox unified NAS and SAN array predominantly with disk, with a B-tree architecture that caches data and metadata on SSDs, enabling reads directly on the nodes. IXsystems Inc. designs consumer-oriented FreeNAS and TrueNAS for enterprises. Customers can purchase bundled iXsystems TrueOS software and TrueNAS hardware or download and install FreeOS on their preferred choice of servers. Lenovo Smart Storage personal cloud devices scale from 2 TB to 6 TB with 2 TB of double data rate type 3 (DDR3) memory and one-button file uploads. Netgear ReadyNAS is available in desktop and rackmount models, promoted as storage for hybrid and private clouds. NetApp Inc. helped pioneer the use of an extensible file system with its Fabric-Attached Storage (FAS) and, more recently, All Flash FAS. Nexenta NexentaStor is SDS that also supports Fibre Channel (FC) and NAS. The software runs on bare metal, VMware hosts or inside VMs on hyper-converged hardware. Nexsan Unity durability-focused arrays handle SAN and NAS protocols, enabling hybrid media to support mixed workloads, especially in rugged physical locations. Panasas ActiveStor parallel hybrid scale-out system runs the PanFS file system. Promise Technology Inc. developed the Promise Apollo NAS to accept two 4 TB disks with Apollo Cloud software. Pure Storage positions its all-flash FlashBlade as a highly scalable platform for big data analytics. QNAP Systems Inc. has an extensive NAS portfolio that spans small and midsize businesses, as well as midrange and high-end enterprise use cases, along with products geared for home users. Quantum Corp. launched Xcellis scale-out NAS to compete with Dell EMC Isilon and NetApp FAS. The keystone to Xcellis is the Quantum StorNext scalable file system. Qumulo Inc. Core file storage was developed by several of the creators of the Isilon technology. The Core operating system (OS) runs on Qumulo C-series and P-series branded arrays, as well as commodity servers. Rackspace enterprise services include Dedicated Network Attached Storage based on the NetApp Ontap OS for managed block- and file-level storage. RackTop Systems integrates BrickStor unified storage with Seagate disk and StorONE enclosures and sells it as the Secure Data Protection Platform (SDP2). Seagate BlackArmor NAS 220 enterprise arrays scale from 1 TB to 6 TB, with smaller BlackArmor models topping out at 2 TB. Seagate Personal Cloud NAS zeroes in the consumer market with capacity up to 5 TB. Spectra Logic introduced the BlackPearl NAS ranging from 48 TB to 420 TB of optional hybrid flash in a 4U rack. SoftNAS Cloud NAS software-only product enables customers to scale data migration to Amazon Web Services (AWS), Microsoft Azure and VMware vSphere. StorageCraft Technology Corp. doesn't technically have NAS but positions the OneBlox platform it acquired from Exablox as a scale-out alternative. Synology Inc. offers NAS devices for business and personal uses, including DiskStation NAS, FS/XS Series, J Series, Plus Series and Value Series. Thecus Technology Corp. markets a range of NAS appliances, highlighted by its flagship N5200 RouStor series. Verbatim Corp. PowerBay NAS supports four hot-swappable HDD cartridges that can be configured for various RAID levels. Verbatim is a subsidiary of Mitsubishi Chemical Corp.
WekaIO VM-deployed NAS software gets installed on flash-enabled x86 servers, using its parallel file system to scale to trillions of files. Western Digital Corp. My Cloud NAS comes in four models with branded HelioSeal helium HDDs. Portable, rugged NAS also are available through Western Digital's G-Technology subsidiary. Zadara Storage cloud NAS provides scalable file storage as a service with the software-defined Zadara VPSA Storage Array. 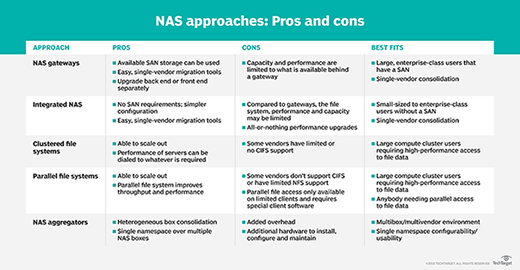 The chart below describes five different ways network-attached storage can be deployed and lists the pros and cons for each approach. Each deployment can easily be managed by a single network manager. Over time, the baseline functionality of NAS devices has broadened to support virtualization. High-end NAS products may also support data deduplication, flash storage, multiprotocol access and replication. Some NAS devices run a standard OS, such as Microsoft Windows, while others may run a vendor's proprietary OS. Although IP is the most common data transport protocol, some midmarket NAS products may support Network File System (NFS), Internetwork Packet Exchange (IPX), NetBIOS Extended User Interface (NetBEUI), Server Message Block (SMB) or Common Internet File System (CIFS). High-end NAS products may support Gigabit Ethernet (GigE) for even faster data transfer across the network. In a network-attached storage deployment, the NAS head -- the hardware that performs the NAS control functions -- provides access to back-end storage through an internet connection. In industry jargon, this configuration is known as scale-up NAS architecture. The two-controller NAS system expands capacity with the addition of drive shelves, depending on the scalability of the controllers. With scale-out NAS, the storage administrator installs larger heads and more hard disks to boost storage capacity. Scaling out provides the flexibility to adapt in tandem with an organization's business needs. Enterprise scale-out NAS systems can store billions of files without the performance trade-off of doing metadata searches. Object storage is an alternative to NAS for handling unstructured data. There is speculation that object storage gradually will overtake scale-out NAS, but it's also possible the two technologies will continue to survive side by side. Both storage methodologies deal with scale, only in different ways. NAS files are centrally managed via the Portable Operating System Interface (POSIX), which provides data security and ensures that multiple applications can share a scale-out device without fear that one application will overwrite a file being accessed by other users. Object storage surfaced as a new method for easily scalable storage in web-scale environments. It often encompasses unstructured data that is not easily compressible, particularly large video files. Object storage does not use POSIX or any file system. Instead, all the objects are presented in a flat address space. Bits of metadata are added to describe each object, enabling quick identification within a flat address namespace. Direct-attached storage (DAS) refers to a dedicated server or storage device that is not connected to a network. A computer's internal hard drive is the simplest example of DAS. To access files on direct-attached storage, the end user must have access to the physical storage. DAS has better performance than NAS, especially for compute-intensive software programs. In its barest form, direct-attached storage may involve nothing more than purchasing the drives to be inserted in a server. However, DAS requires the storage on each device to be separately managed, adding a layer of complexity. Unlike with NAS, DAS does not lend itself to shared storage by multiple users. A SAN organizes storage resources on an independent, high-performance network. Network-attached storage handles I/O requests for individual files, whereas a SAN manages I/O requests for contiguous blocks of data. While NAS traffic moves across Transmission Control Protocol/Internet Protocol (TCP/IP), such as Ethernet, a SAN can route network traffic over the FC protocol designed specifically for storage networks. SANs can also use the Ethernet-based iSCSI protocol instead of FC. While a NAS can be a single device, a SAN provides full block-level access to a server's disk volumes. Put another way, a client OS will view a NAS as a file system, while a SAN is presented to disk as the client OS. Until recently, technological barriers have kept the file and block storage worlds separate, each in its own management domain and each with its own strengths and weaknesses. The prevailing view of storage managers was that block storage is first class and file storage is economy class. Giving rise to this notion was a prevalence of business-critical databases housed on SANs. With the emergence of unified storage, vendors sought to improve large-scale file storage with SAN/NAS convergence. This consolidates block- and file-based data on one storage array. Convergence supports SAN block I/O and NAS file I/O within the same set of switches. The concept of hyper-convergence first appeared in 2014, pioneered by market leaders Nutanix and SimpliVity Corp. (now part of HPE). Hyper-converged infrastructure (HCI) bundles the computing, network, SDS and virtualization resources on a single appliance. HCI systems pool tiers of different storage media and present it to a hypervisor as a NAS mount point, even though the underlying shared resource is block-based storage. However, a drawback of HCI is that only the most basic file services are provided, meaning a data center may still need to implement a separate network with attached file storage. Converged infrastructure (CI) packages servers, networking, storage and virtualization resources on sets of hardware prevalidated by the CI vendor. Unlike HCI, which consolidates devices in one chassis, CI consists of separate devices. This gives customers greater flexibility in building their storage architecture. Organizations looking to simplify storage management may opt for CI and HCI systems to replace a NAS or SAN environment. In addition to NAS devices, some data centers augment or replace physical NAS with cloud-based file storage. Amazon Elastic File System (EFS) is the scalable storage in Amazon Elastic Compute Cloud (EC2). Similarly, Microsoft Azure File furnishes managed file shares based on SMB and CIFS for access by local and cloud-based deployments. Although not as common now, NAS gateways formerly enabled files to access externally attached storage -- namely, connecting to a high-performance area network over FC or just a bunch of disk in attached servers. NAS gateways are still in use but less frequently sought-after by customers, who instead might gravitate to a cloud storage gateway, object storage or scale-out NAS. A cloud gateway sits at the edge of a company's data center network, shuttling applications between local storage and the public cloud. Nasuni Corp. created the cloud-native UniFS file system software, bundled on Dell PowerEdge servers or available as a virtual storage appliance (VSA). Nasuni rival Panzura provides a similar service with its Panzura CloudFS file system and Freedom Filer cache appliances. Should network-attached storage vendors be worried about the cloud? Between Nimble Storage and Seagate introducing new NAS devices recently, I'll be curious to see how the market turns out. With more and more companies, businesses and organizations moving to cloud based storage solutions over network-attached storage, the vendors of the network-attached storage systems have some justified reasons to worry. Much like the "horse whips" became obsolete with the advent of the automobile, the network-attached storage systems are facing obsolescence. It is only a matter of time before the majority of storage is all cloud based. Network-attached vendors need to adapt to this change. It may, indeed, be "a matter of time before the majority of storage is all cloud based" but it's likely to be a long, long time. There are still significant barriers to storing active data in a cloud storage service, bandwidth not the least of them. That said, I think all traditional storage vendors should be a little nervous about the cloud (and most are, and most are taking some actions). As long as we continue to collect data without discarding any, storage capacity will be an issue. And as data gets older and less useful, cloud storage becomes a more attractive option. They are and they should be. Having worked on enterprise NAS for more than a decade it was interesting and challenging to compete in "the NAS war". For the most part the NAS wars are over, just in time for a paradigm shift - ironic, isn't it? It's the migration of compute to the cloud that is at the heart of the matter. NAS is a natural complement to compute and in most environments they don't exist without each other. So a big concern for enterprise NAS vendors is the shift from on-prem compute to cloud compute. NAS appliances will continue to be cash cows for years to come and they will continue to be critical components in most storage ecosystems. Cloud is definitely crashing the party and will incrementally steal an increasing share of the market as cloud offerings mature and enterprise confidence in cloud grows with it. How to enable file cache.. some times a simple CD command on the Mount of NAS takes 45 mints to 1 hr.